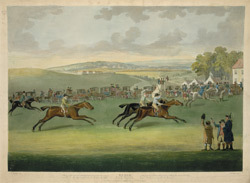 View of the Epsom Derby Sweepstake by John Nost Sartorius (1759-1828). In 1779 Edward Smith Stanley, 12th Earl of Derby, created a flat race track at Epsom. He organised ‘The Oaks’- a race coving one and a half miles and which was restricted to three year old fillies. This race was so successful that another flat race was organised- one that included colts. Stanley and his colleague Sir Charles Bunbury, tossed a coin to decide the name of the race and Lord Derby won. The first Epsom Derby, which was just a mile in length, was won by Sir Charles’ horse Diomed. The famous ‘Tattenham Corner’ was not introduced until 1784 when the course was extended to its current distance of a mile and a half.